Hardy swimmers aim for ice miles. Allison Cuthbertson is 1 of a team of 3 local swimmers aiming to complete an ‘ice mile’ in February 2019. At this time of year most people are putting on their thick winter jumpers and turning up the heating at home. Not so for 3 Hull people who are aiming to swim an ‘ice mile’ in February 2019. Andy Butler, Allison Cuthbertson, and Angela Khudonazarova are all regular open-water swimmers at Welton Waters Activity Centre. Lorry driver Andy has been open-water swimming for 5 years, and has completed several challenges already. Last year he swam the length of Coniston water in the Lake District. He’s also completed a 10 kilometre open-water swim at Blue Lagoon diving and leisure complex at Womersley near Pontefract. Andy has also completed a couple of iron man distance triathlons. 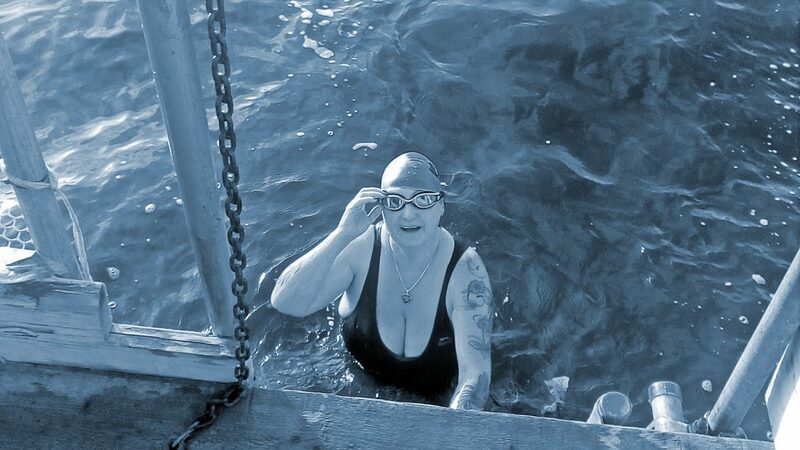 Adult learning tutor Allison Cuthbertson did her first open-water swim only a year ago, after seeking new challenges. She too has previously completed a number of other endurance feats including ‘Hell on the Humber’ running events, and 6 sprint triathlons. Angela Khudonazarova, mum of 3, loves the freedom that open-water swimming offers. She started 3 years ago, and now looks for opportunities to swim new waters when she travels for work and for family holidays. All 3 took part in an International Ice Swimming Championship event earlier this year, completing a 50 metres relay together, the water temperature was a chilling 2.6 degrees celsius. Now, the 3 have set their minds on completing a quite staggering challenge, swimming an ‘ice mile’ each. The swimmers are entering an International Ice Swimming Associations event at Hatfield Outdoor Activity Centre next February. The 3 will attempt their ice mile in water under 5ºC, each wearing only a swimming costume, swim cap and a pair of goggles. There are, of course, dangers involved for the swimmers, most notably temperature shock and hypothermia. “The swimming distance is not the challenge,” explains Allison, “it’s getting acclimatised to the cold that’s the issue.” Cold showers, living in a cold house, and plenty of winter swimming in open-water that’s dropping in temperature week by week, all is helping the swimmers to get prepared. They also have to be medically assessed as fit for the event, and this is offering its own challenges too, as the team is finding it difficult to find a GP in Hull who is able to do the required ECG tests and examination. They need help with this. Currently only 408 ice miles have ever been swum, by 275 individual swimmers globally. If the 3 Hull swimmers are able to complete their chilling swim in February 2019, the city will represent 1% of all ‘ice mile’ swimmers worldwide. Whilst the swimmers’ friends and families regularly refer to Andy, Allison, and Angela affectionately as “the nutters”, their achievement would be quite serious indeed. Be the first to comment on "Hardy swimmers aim for ice miles."